PUEBLO, Colo. – Reigning World Champion Kaique Pacheco looked at three-time World Champion Silvano Alves and laughed at the question. Why was Pacheco entered in this coming weekend’s Neighborhood Ford Store Challenge Pendleton Whisky Velocity Tour event in Wheeling, West Virginia? The two-day bull riding is one of three PBR events being held in the United States this weekend while the Unleash The Beast has a scheduled off weekend. He could have taken the weekend off to continue strengthening his left knee. Instead, Pacheco is headed to West Virginia along with No. 10 Ezekiel Mitchell, No. 11 Alisson de Souza, No. 16 Rubens Barbosa, No. 17 Alves, No. 21 Danilo Carlos Sobrinho, No. 25 Scottie Knapp, No. 26 Eduardo Aparecido, No. 30 Dylan Smith, No. 31 Stormy Wing, No. 34 Sean Willingham and No. 35 Derek Kolbaba. Wheeling has the most Top 35 riders (11) competing of any of the PBR events this weekend. Fans can watch all of the competition on RidePass beginning at 8 p.m. ET Friday. So why is the Brazilian rider going to Wheeling? “Ride bulls,” Pacheco answered before laughing. The fact is, according to Pacheco, he feels close to 100 percent and is not concerned about his knee. After missing the first month of the 2019 season to rehabilitate his knee, the biggest thing for Pacheco has been getting his timing back. The Itatiba, Brazil, bull rider easily could be 6-for-9 in his four Unleash The Beast events since returning if not for three buckoffs beyond the 7-second mark. Pacheco is instead only 3-for-9 on the UTB and 4-for-10 overall. The 2015 Rookie of the Year may have even won his first event back from injury if not for a 7.87-second buckoff against Little Bob and 7.42-second buckoff against Old Fort Days at the Mason Lowe Memorial. Therefore, even Pacheco’s knee injury continues to be a topic of conversation, he does not believe the knee is an issue. Pacheco is coming off a 0-for-2 performance at the U.S. Border Patrol Invitational in Duluth, Georgia, last weekend. There is also another reason for Pacheco to be nonchalant about his slow start to 2019. Last year, he began the season a horrid 7-for-27 and went a stretch of six consecutive events without earning a single point toward the world standings. 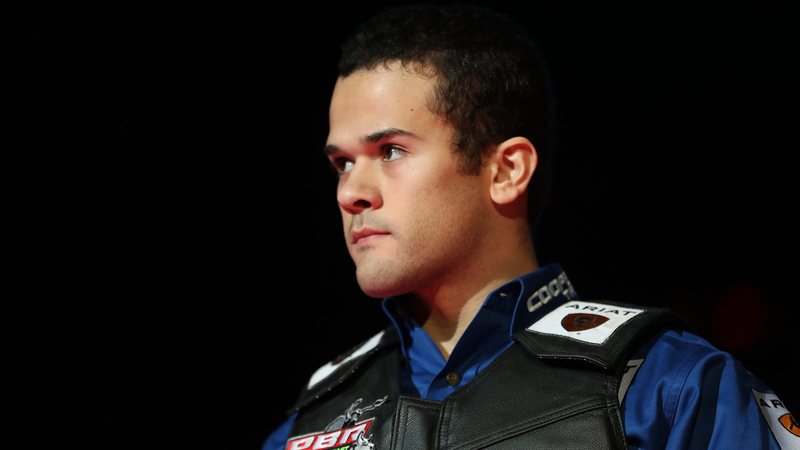 The slump was magnified because Pacheco, hindered by a lower-body injury, had collapsed during the stretch run to the 2017 PBR World Finals. Pacheco said he had struggled with his timing during his slump in 2018, which is why he knows the best way for him to get back on track this year is by getting on multiple bulls and improving his timing. “It was the same thing with my leg last year,” Pacheco said. He is confident he will bounce back soon. While the fifth-year pro is far out of the Top 35, he still has a long way to go before being subject to the UTB cutline. Pacheco has four guaranteed events before he would have to enact his 10 World Champion exemptions if necessary. No. 35 Kolbaba is 216.67 points ahead of Pacheco in the world standings. One rider can earn a maximum of 270 points in Wheeling with two long round victories (50 points each) and the event average win (170 points). Round 1 features 45 riders, with the Top 30 scores/buckoff times advancing to Round 2 on Saturday night. The Top 15 riders in the event qualify for the championship round. Pacheco says he is not worried about points or about even joining Alves as the only two riders in history to win back-to-back world titles. For now, it is same old, same old.